Tweaked Config.files for very old Pc's (Or Laptops), that can barely run Witcher 3. Edit 22.10.2015: Im not going to update it anymore for a very long time. Sorry. Check the Comment section for more infos on how to update it yourself. 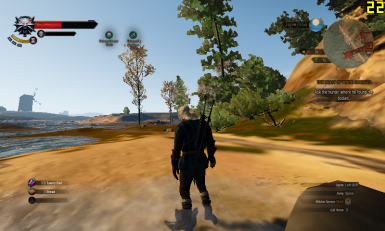 If you are like me playing on a laptop (or pc) that get's around 10 FPS on low settings, but you still want to play Witcher 3 no matter what, then you've got the right mod. I tried everything that I managed to find via. Google, going through various config files and hours and hours of experimenting. In the end I managed with my Laptop (See below for specs) a decent 23 - 30 Fps from the average 10 FPS on the ingame low settings. 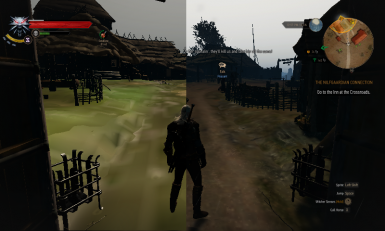 It basicly disables everything that looks remotely good and turns every possible setting down, even further then W3HC - Witcher 3 Hunter's Config allows. If you are familiar with Gothic 1 and 2, that's how everything will look like, more or less. But you wouldn't be here if it bothers you, would you? This config file uses a very, very low resolution setting (800x480), if you have issues with your eyesight, then it's probaly better to skip this mod or increase the resolution manualy. Just take in mind, that an increased resolution might eat up quiet a few FPS. - You will probaly notice alot of weird shadow pop-in and, mostly outdoor, shadows that move with your character. This happens because the view distance of the shadows is greatly reduced. - The Resolution, as I mentioned, is very, very low. (800x480) If you have a few spare FPS, then increase the Resolution. - The text will be almost unreadable. Seriously, it's god awfuly hard to read because of the resolution. Increase it if you can! - There's almost no texture on armor, most notably. - You probaly should tweak the Resolution. - Only water looks great. I haven't found a way to decrease the quality for more performance yet. - The alternative movement on 1.07 Ultra low config is activated. - Under 9000 only gives me 3 more fps compared to Ultra Low. If you don't want to lose the texture details on Ultra Low but want those 3 extra fps, than you can edit the MaxVisibilityDepth= to 0 It's located in your user file. It basicly changes how far you can see trees. With 0 they will start to pop up right infront of you thou. 4. Copy the rendering.ini from the mod and overwrite if neccesary. 7. Make sure to delete user.settings.bak if you haven't already. 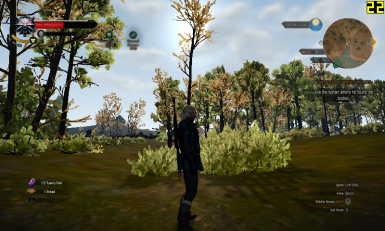 Witcher 3 will generate a new one with the new settings. Note: Remember to change both files to "Read only", or it might get overwriten back to low quality. Also, before playing, change your desktop resolution to something around 1024x768 if you are using my resolution. If you want to change the resolution of Witcher 3, Navigate to C:\Users\--YourName--\Documents\The Witcher 3 and open user. Search the following line Resolution="800x480" and change it to your desired amount. Don't forget to set it back to read only. Annoyed by the save / load version warning? You can easily tweak it yourself. Open user (C:\Users\--YourName--\Documents\The Witcher 3) search for ShowCompatWarning= and change it to false. 1. Just delete user, user.setting.bak and rendering.ini and reapply your old backup. If you have any feedback on what else could be adjusted for maximum performance, feel free to drop a comment. I would be happy to experiment. - Some people get increased FPS by deleting the file APEX_ClothingGPU_x64. It's located in C:\...\The Witcher 3 Wild Hunt\bin\x64 ... I didn't but you might. No harm trying, right? - If you have micro stutterings, navigate to C:\...\The Witcher 3 Wild Hunt\bin\config\base Open gc.ini and search for ObjectMemoryTrigger. Set it to 512. - Reduce the Resolution even further. - Adjust the MaxVisibilityDepth= to 0 It's located in your user file. With 0 they will start to pop up right infront of you. - Another way to increase FPS is by tilting the camera above the Witchers head, effectivley decreasing the distance you can see and those decreasing the strain on your FPS. If you want the cemara to stop auto-adjusting itself, download the Debug Consol enabler and type the following line ingame: ToggleCameraAutoRotation() You'll have to type it everytime you load a game / start the game or it goes back to default. 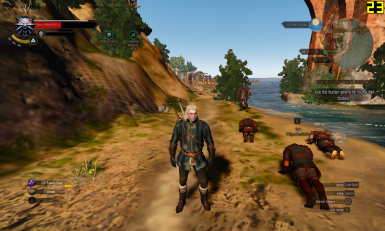 Running Witcher 3 - Wild Hunt at 23 - 30 fps.